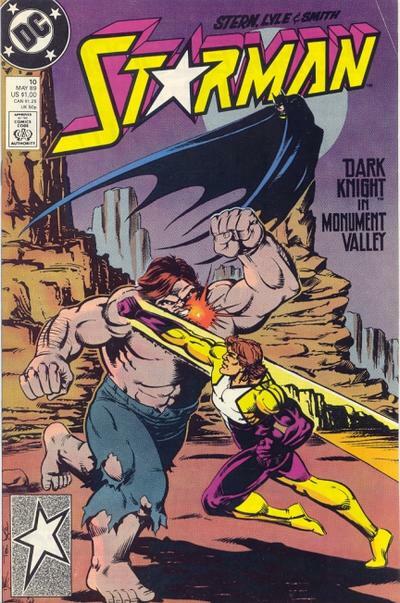 This is my first Comic., Starman #10, Vol.1 "Dark Knight in Mounment Valley!". Cover and interior pencils by Tom Lyle, inked by Bob Smith, colors by Michele Wolfman and written by Roger Stern. Guest-starring of course the Batman. Originally published in May of 1989, I found my copy in a Grocery Store in Baltimore, MD I would assume about that time but I'm not sure how long that issue sat on the rack waiting for me that day. My grandmother took pity on me and let me buy it, or she bought it for me or, somehow short of stealing it I now possessed the thing that would light my way through life even when ignoring it. I sat staring, not reading it at first. It took awhile to be able to read the words because my eyes danced across the color halftones and images, I was lost in it all. I was in awe, the expressiveness that Tom Lyle threw down and Bob Smith drove home amazed me. The first page had the titular hero laying in mess of food debris unconscious, for me thats where it started for me, I had no idea what was going on and it hooked me. I devoured every panel over and over again. I'm not sure how long that this comic book was my one and only comic. 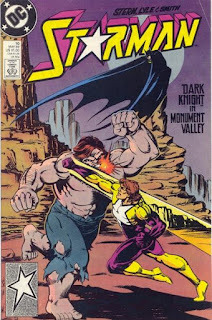 Studying the cover now with the training of a serious student of art (and all that yadda yadda) I see the strong design 'Zig Zag' of Batman's cape, Blockbuster's arm (the villain of the story), the connection of Starman's fist, down to his knee and out to his foot ( it could actually start with the logo itself). I didn't know it but I did, the way illustrators use universal truths in design to speak to us without conscious thought mucking up the transfer between us and art. There are a few students that are lucky enough to learn straight from Mr. Lyle at SCAD.